Royal Belfast Academical Institution will face Methodist College Belfast in one of the standout ties of the Danske Bank Ulster Schools Cup quarter-finals. Rainey Endowed School in Magherafelt have found themselves in the fortunate position of having been drawn at home for the third time in the course of this season’s competition as they prepare to take on Wallace High School, regarded as one of the favourites. The Rainey Endowed team is coached by Chris Campbell, a former winner of the competition when he was a pupil at the school. Ulster Schools’ and U19 player, Bryn Davies, is the team captain and Bryn has led his team through to a great deal of success this season. There are three sets of brothers playing in the squad this season. Twins, Ryan and Matthew Brown are joined in the Rainey pack by Daniel and Sam Clarke. In the back division, David and Matthew Dripps feature regularly with their try scoring exploits. The vital link between the Rainey Endowed School forwards and backs is Tim Campbell who is a son of the Rainey coach, Chris Campbell. These players, alongside team captain, Davies, and the hard-working Brian Hall, all shone with their performances in their last Schools’ Cup outing against the Ballyclare High School. Wallace High find themselves on the road tomorrow and will see themselves as firm favourites to win the tie. Coached by Derek Suffern, the team is captained by Reuben Crothers, an outstanding No 8. Reuben has led his team well throughout what has been a very successful season results-wise thus far. Nathan Doak, a very talented scrum half, is the leading points scorer on the team this season. Nathan has an eye for the whitewash as well as being a very accurate kicker out of hand and off the tee. The talent of many of the players available to the Wallace High coaching staff has been recognised by the management teams of Ulster Schools’, Ulster U19s and Ireland U18 Schools’ squads. Doak has been involved with all three squads with Crothers, Ben Carson and Joel Dundas having represented the Ulster 18 Schools’ team as well as the Ulster U19 team. Two of the biggest names in the Ulster Schools’ game meet on the pristine Pirrie Park Paddock Pitch tomorrow. Methodist College carry the mantle of favourites to win the competition and their results this season against all-comers from schools in Ulster, Munster and Leinster would suggest the tag as favourites is fully justified. The top points scorer is Ethan McIlroy, a talented player who is equally at home playing as a full back or on the wing. Not only has Ethan an eye for the line but he is a top class place kicker as well. Ethan has achieved representative honours with the Ulster U19 team this season and has been involved in Ireland U19 training camps. Thomas Armstrong, Robbie Armstrong and Chris Larmour are also responsible for scoring a high percentage of the tries this season. Traditionally the basis for any Methodist College team has been with their pack. In players such as Kevin McNaboe and Thomas Crangle, both of whom have been involved with previous Danske Bank Ulster Schools’ U18 squads, they have two of the finest forwards playing schools’ rugby at the minute. They are joined in the hard-working and efficient pack by players such as Daniel Humphries, Ted Linton, Ben Gourley and Adam Reid. 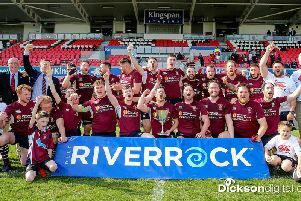 The Royal Belfast Academical Institution team has struggled at times this season due, in no small part, to the extensive injury list the squad has had to endure. The team is coached by Jason Morgan, the Director of Rugby at the school, and is captained by Angus Adair who has, unfortunately, missed quite a few games due to an injury. It will be seen as a major boost if Angus is able to feature tomorrow as he is a powerful runner who leads from the front and is equally at home playing in the centre or the back row. Robin McIlveen, an Ulster Schools’ U18 Centre, is also an exceptional player with pace, great defence and the vision to read the game well. A natural leader, Robin has been filling in as captain in the absence of Adair. Jude Postlethwaite is an Ulster Schools’ U18 winger who has recently moved into the inside centre position for his team. He is an extremely athletic individual who is dangerous with ball in hand and possesses great distribution skills as well as being strong defensively. Paddy Eames is in his first year of 1stxv Rugby at the school having broken through with some fine performances on the 2ndxv. Paddy is involved with the Ulster Schools’ U17 squad and will be looking to continue his development with Ulster Schools’ representative squads. Paddy is an athletic individual who possesses great jumping prowess and he has the ability to dominate the battle in the air at lineout time. His forward partner, Daniel Eakin, is the workhorse of the pack. Daniel is just back from a lengthy lay-off due to injury and is hoping to make his final year at Royal Belfast Academical Institution count. Both these players showed great ability with their performances in the previous round. Alex Weir is an exceptionally clever player who is very physical and always manages to make a nuisance of himself at break down time. Bradley McNamara is a very dangerous runner and will be only too happy to show his attacking abilities from either out half or full back. All these players are backed up by other talented players such as Rory Adair, Callum Stewart, Jared Waite, Marco Manso, Josh Patterson, AJ Hussell, Zac Davidson, Max Preston and Jack Leathem. Ballymena Academy welcome Royal School, Armagh team to the Galgorm Road venue. Ballymena will be hopeful of maintaining their undefeated record at home this season and, because of that impressive record, could see themselves as favourites to progress to the semi-finals. Patrick has received great assistance from his vice-captains, Alex McKinney and Harry Cooke, and this trio has set high standards on and off the pitch for their squad members. Royal School, Armagh will travel to Ballymena with a great deal of confidence after defeating a very talented Bangor Grammar School with a comprehensive way victory in the fourth round. Aaron Woods leads his team from the back row and has seen his team-mates put in some great performances in the course of the current season. However, there is a feeling in the Royal School, Armagh camp that there is a deal more to be done to improve consistency in the performances and an overall improvement in results. Charlie Worth, a young exciting scrum half who has played for both the Ulster Schools’ U18 and the Ulster U19 teams earlier in the season, is the leading points scorer for the team with his eye for the whitewash and his very accurate kicking skills. Peter Taylor is the leading try-scorer and he has taken advantage of the clever play of Nicholas Jennings whose creativity has been central to the team this season. Campbell College, Belfast - the current holders of the Schools’ Cup - are favourites for this tie against Enniskillen Royal Grammar School. Campbell College is coached by the experienced Brian Robinson and captained by Rex Tinsley, who brings great leadership qualities to the role. As well as being a very astute captain on the pitch Rex is also a calming influence when playing in the centre. Players such as Jack Stinson, Conor Rankin, Paddy McAlpine, Jack Boal, Finlay Parks and Luke Collins have been involved with various Ulster and, in some cases, Ireland Age Grade squads and Rankin is the leading points scorer on the team. He has caused untold problems for opposition teams this season with his eye for the line as well as a deadly accurate boot off the tee. Tobi Olaniyan, Ben Rainey and James Johnston form a dynamic break away trio in the Campbell College back row. Their robust performances against Sullivan Upper in the previous round were central to Campbell College emerging as victorious from that game. Danny Williamson, Rex Tinsley, Kieran Robertson, Dara Gaskin and Jack Boyle have all been regular try-scorers for the team this season and will all be hoping to add to their totals as they prepare to defend their Danske Bank Ulster Schools’ Cup winner’s title. Enniskillen Royal Grammar School seemed to have played well within themselves in the course of their win against Down High School in teh fourth round. The team is coached by Ashley Finlay who has a new member of staff in Stuart McCain to assist with the backs and Alistair Keys working with the forwards. The team is essentially a young squad featuring some ten Year 12 players as regular starters. Team captain, Alex Parke, who is also Head Boy in the school, has led his young charges to 14 victories this season and will be looking to extend that sequence tomorriow. Alex gets great support, on and off the pitch, from his scrum half, Matthew McConkey, who is his Deputy Head Boy. Eddie Keys, son of forwards coach, Alistair, has been central to the success of the team this season with his ability to score tries as well as kick points. Callum Smyton is a hard-working back row forward whose explosive play has seen him top the try-scoring list and his battle with his opposite number on the Campbell College team, Tobi Olaniyan, could be seen as central to the outcome of this game. Alex Parke forms a formidable centre partnership with Robbie Mills who is an Irish Rowing Champion. The team’s work ethic will be tested to the limit tomorrow.